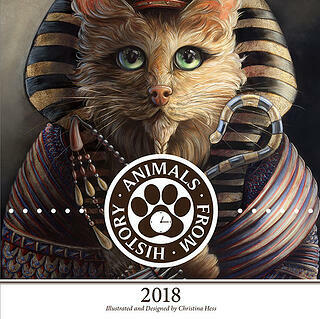 Christina Hess, PCA&D Chair of Illustration, is conducting a Kickstarter Campaign for a repeat iteration of her popular Animals from History Calendar. An earlier year’s calendar version of her popular Animals From History series was created in 2012 with a prior Kickstarter Campaign. “I thought it would be a great way to ring in the new year with some more cheeky characters,” Christy said. Featured in the 2018 Animals from History Calendar are four cats, four dogs, one skunk, one bird, one sloth, one chipmunk and one deer. The personality spoofs range from David Bowie to King Tut. The calendar, which is scheduled to be delivered in early December runs from January 2018 to January 2019 and is available in two sizes: 6"x6" which measures 6"x12” when open, and 12"x12" which measures 12"x 24" when open. The calendars purchased through the kickstarter campaign will be shipped in December. Hess’s Animals From History have been covered by multiple media outlets including Mental Floss, Jezebel.com, Juxtapoz Magazine, ABCNews.com, and MyModernMet.com. Hess has won awards and admittance into annuals and competitions such as Artist Guest of Honor at Armadillocon, Imagine FX Magazine Artist of the Month, first place in (no name) art group grant, Phillustration 4 Best of Show, Spectrum 18,19 & 20, Exotique 7, Silver Award for Self Promo category in the Society of Illustrators 50 LA, Expose 10 & 11 and 3x3 Magazine's Pro & Childrens Shows. She is featured in "Women of Wonder" and exhibited in the "Point of Vision" show at the Society of Illustrators, NY. Her work is featued at the Ian Russell Gallery in Prescott, AZ.